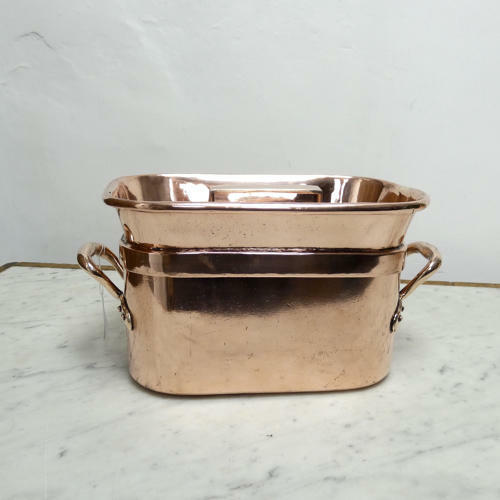 A small, French copper daubiere or basing pan This type of pan was made to sit onto the heat source and the lid, with the raised rim, would be filled with hot coals, so the contents would be cooking from both above and below. It was the original form of slow cooker. This one dates from c.1860. It is well made, from a heavy gauge of copper, and it has castellated seams around the base and up the side. It has brass handles to both sides of the pan and also to the lid. There is a small, brased repair to one end of the lid, where there had been a small split, and there is slight marking to the copper, from use. Other than this it is in very good condition. The interior has been re-tinned quite recently and it is in very good, usable condition.